B0817. 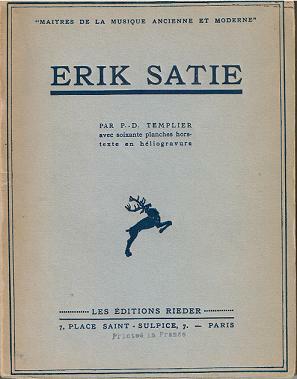 ERIK SATIE (French Text). PIERRE-DANIEL TEMPLIER. 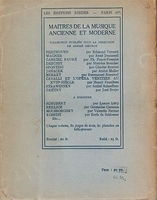 Paris, Les Éditions Rieder, 1932. 107pp, plus 60pp of photos and illus. The text consists essentially of three major subjects: Satie's life, his character, and his works, with an appended, up-to-date discography. Well illustrated. Softbound. Superb copy. "In its equally deceptive artlessness, Templier's aesthetic-personal vignette of 'Crin-Crin' (as Satie was known to his family) leaves the impression of a rather disagreeable, fiercely independent figure whose droll calligraphic doodles, and delicately perfect musical penmanship, sampled in the present volume, are more than a little characteristic of the man and his legacy." “Erik Satie was an important French composer from the generation of Debussy. 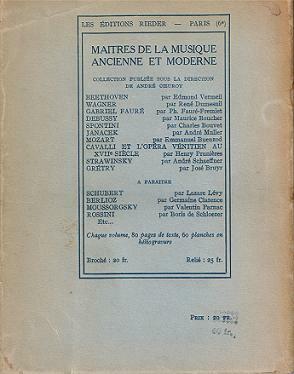 Best remembered for several groups of piano pieces, including TROIS GYMNOPÉDIES (1888), TROIS SARABANDES (1887) and TROIS GNOSSIENNES (1890), he was championed by Jean Cocteau and helped create the famous group of French composers, Les Six, which was fashioned after his artistic ideal of simplicity in the extreme. Some have viewed certain of his stylistic traits as components of Impressionism, but his harmonies and melodies have relatively little in common with the characteristics of that school. Much of his music has a subdued character, and its charm comes through in its directness and its lack of allegiance to any one aesthetic. Often his melodies are melancholy and hesitant, his moods exotic or humorous, and his compositions as a whole, or their several constituent episodes, short. He was a musical maverick who probably influenced Debussy and did influence Ravel, who freely acknowledged as much. After Satie's second period of study, he began turning more serious in his compositions, eventually producing his inspiring cantata, SOCRATE, considered by many his greatest work and clearly demonstrating a previously unexhibited agility. In his last decade he turned out several ballets, including PARADE and RELÂCHE, indicating his growing predilection for program and theater music. Satie was also a pianist of some ability. The years following his military service formed a bohemian period in Satie's life, the most significant events of which would be the beginnings of his friendship with Debussy, his exposure to eastern music at the Paris World Exhibition, and his association with a number of philosophical and religious organizations (most notably the Rosicrucian Brotherhood).